As part of our Pacific Islands Mission (the other branch being in Papua New Guinea, Australia Needs Fatima brought the Pilgrim Virgin statue to Fiji for seven weeks in August and September. Our two custodians were Jacques Geliot and Valdis Grinsteins. The itinerary was set up by a team of seven local people in Fiji appointed by His Grace, Archbishop Petero Mataca of Suva. The team, under the guidance of the archbishop, set up a flawless programme and our grateful thanks goes to them all. Landing in Suva on 23 August our two custodians found themselves in a culture very different to Australia. From the accompanying photos one gets an idea of the fervour and enthusiasm of the Fijian people for Our Lady. The hot tropical weather notwithstanding, the seven-week tour took in an astonishing 27 parishes, 45 schools, 40 villages, and over 100 hundred home visits throughout the islands of Viti Levu, Vanua Levu, Ovalau, and Kandavu. The Statue travelled more than 2,000 kilometers by road and sea. The custodians distributed 37,000 beautiful pictures of Our Lady, rosary beads and medals. True to Oceania culture, the Fijians are very kind, hospital, courteous and formal. While their enthusiasm for Our Lady was constant, so too was their decorum, respect and sense of ceremony. 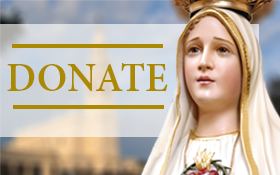 In all 35,000 people took part in the events and venerated the Pilgrim Virgin of Fatima.